Political warmth is on an increasing trend in Odisha as elections are on the head and many expect it to happen earlier than usual. Confident about its electoral success until a few weeks ago, Biju Janata Dal (BJD) now seems to be worried a lot since dismissal of the veteran politician Dr. Damodar Rout and the speculations following it over formation of another regional political outfit to challenge the ruling party on the lines of the true ideology and dreams of late Biju Patnaik, the legendary person whom people of Odisha consider the icon of pride. Dr. Rout was expelled on September 12, 2018 and dismissed the next day from BJD by party president Naveen Patnaik for "anti-party activities." The anti-party activities of Rout included his role as a whistle-blower to expose corruptions in departments of agriculture, cooperation and health, which he headed as cabinet minister during different times in the Naveen Patnaik led government, amounting over 1000 crores from the state exchequer. It was not all. He even pulled in his colleagues and top bureaucrats to the dock terming them as promoters of corruptions and nepotism, and protectors of the corrupt. Rout's allegations obviously raised fingers towards the office of the Chief Minister though he (Rout) just before being sacked from the party tried to clarify that he never uttered the name of the Chief Minister in any of his corruption allegations. "I only raised the issue of corruption," Rout maintained. Even though opposition parties demanded probe into the allegations made by Rout by a reliable agency, the Chief Minister simply dismissed the charges terming them all as "ridiculous". Before Rout, senior leaders like Baijayant Panda and Prafulla Ghadai have faced similar actions from the BJD president allegedly for "anti-party activities." In case of Panda, it was for blaming one specific bureaucrat for running the government bypassing political leadership in the state and issuing diktats to party leaders and workers. However, Ghadai had to face the action because of the statements he made in a newspaper interview suggesting that the Chief Minister functioned on advice of a coterie than his cabinet. Baijayant quit BJD in May 2018 after his suspension from the party in January 2018 while Prafulla Ghadai was expelled from the party in September 2014. As one senior BJD leader once said during a casual conversation, "you are the worst enemy of Naveen Patnaik and thus his BJD when you raise fingers towards or talk against IAS (Indian Administrative Service) officers in front of him." 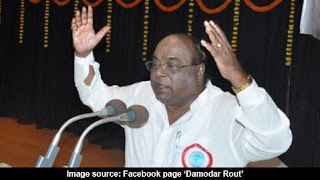 Unlike the other two members, Dr. Rout, also referred by many of his colleagues in politics as "Loud-Mouth veteran," didn't limit his tongue in criticising the way the government and BJD is being managed by one bureaucrat and his three relatively young aides from the party but he vomited a few bombshells of corruption in different departments too. Despite the fact that the Chief Minister just ridiculed all the allegations made by Rout, partial confirmation of the scam in a few districts in regard to sapling plantation by the agriculture minister Pradeep Maharathy in the floor of the assembly house and order for an official inquiry instead of vigilance probe into the scam related to purchase of polythene by Odisha State Cooperative Milk Producers' Federation (OMFED) without proper tender management certainly hinted on some truth behind the allegations. This apart Rout also claimed that corruption to the tune of rupees 800 crore was made in the cooperation department in purchasing computers for 700 cooperative societies across the State and in disbursing agricultural loans to farmers. The general expectation was that Naveen would order an inquiry into the allegations at least to keep the face of his government unstained and punish the culprit if anybody was found to be. But nothing of that sort happened but the whistle-blower was dismissed from the party in power now. Instead of cleansing the image of the government and the BJD to make it ready to face the coming elections, party leaders in and out of the government have now resorted to offensive remarks on Rout to brand him as corrupt and tainted in public. The offensive game played by BJD leaders has only boomeranged by confirming high prevalence of corruption and nepotism in the government and causing double damage on the face of the Naveen Patnaik government while empowering the opposition with more valid cards to play. With the open declaration from Dr. Rout to hold a march across the State to raise the issue of corruption against the government and the possibility of a union of leaders who have either left or have been ousted from BJD but in politics since the days of Biju Patnaik as his close associates or acquaintances, BJD leadership is all in action to ensure that no stone to diffuse these attempts is left unturned. In its first bid, BJD has resorted to colour the leaders thrown out of the party as villains against Naveen Patnaik by using its mass of workers like a mob raising slogans against out-gone leaders, burning their effigies, showing indecency and vandalism during their public appearance, and so on to make them unacceptable in public. This has become a political formula of the BJD since its success in demeaning party's former strategist Pyari Mohan Mohapatra after his alleged coup attempt of May 29, 2012. Anybody who has seen the crowd and its behaviour at the Bhubaneswar airport upto Naveen Niwas on the day of arrival of Naveen Patnaik following the alleged coup plan by Mohapatra can well imagine the effectiveness of the formula. The next is to divert public attention from the hunting issues taking advantage of the short-life memory of people by grabbing opportunity out of any development or event and escalate it to an issue, relevant or irrelevant. This time the opportunity has come from former BJD leader and member of parliament Baijayant Panda who flew with his two friends, on September 15, 2018, by a helicopter over Chilika lake, Puri and Konark covering a stretch of coastal Odisha to reach Kendrapara. Even though none of these places happens to be a no-flying area, the State police has seized the helicopter used by Panda accusing him of flying it low over eco-sensitive Chilika Lagoon. As per news reports and as explained by Panda in a video shared through social media, the Police has got down to this point after several revisions to the original FIR (first information report). Following inquiry by the Odisha police, scientific investigation into the particular incident of flying is being conducted by the office of the Director General of Civil Aviation (DGCA), India. While speaking to media, the Biju Patnaik Airport Authorities had confirmed earlier that the chopper had all requisite permission and its trajectory was shared with the concerned authorities. Now the question is, if flying a helicopter over an eco-sensitive area is such a grave issue, why the government didn't act with equal promptness in 2011 when news accusing Baijayany Panda of flying low over Satkoshia tiger reserve came in media and the then union minister of forest and environment Jairam Ramesh wrote to Naveen Patnaik requesting action? Was the government silent then because of the camaraderie between Panda and Patnaik as leaders of the same party? And, is the quick action because the old camaraderie has broken, Baijayant is out of BJD, and emerging as a threat to the party? Adding to the troubles of Panda and to the advantages of BJD and the Odisha government is a video with remarks, claimed to be satirical, based on the panels of amorous sculptures at the Sun temple of Konark by Abhijeet Iyer Mitra, a co-traveller during Panda's controversial helicopter journey over coastal Odisha. It's a fact that individual views are always personal and it's foolish to blame someone for the views or perspectives of a friend or somebody else. But, as the remarks by Mitra have now been escalated to an issue of hurting the sentiment of the people of Odisha by insulting its rich monumental architecture, he is deliberately introduced by BJD leaders as well as a part of media as "friend of Baijayant" to tarnish the image of the latter by entangling him with a controversy he has no role in. In case the government and its police find such remarks, be it satirical or an intended assault, to be a fit case for action then it should proceed to prosecute the assaulter, not his friend. But, the way Baijayant Panda is dragged into the recent controversy, it's quite indicative that he, not Mitra, is the primary target! To give a reason to BJD's discontent, Panda's meeting with Rout post dismissal of the latter from the party sparked speculations about a new political outfit to counter BJD in the coming general elections. If so happened, Panda by virtue of his personal rapport with and access to top leadership of national level parties would play a major role in building coalition to form a new political equation in the State. BJD leaders, probably, hope to fetch two benefits through the spoilsport they play. One is diverting public attention from the issue of corruption raised by Dr. Rout, and the other is discrediting Baijayant Panda in the public to stop him from emerging as a threat to BJD. But such offensive actions cannot save the face of BJD from charges of corruption and bureaucratic highhandedness bypassing political leadership in the system of governance, as made by leaders like Dr. Damodar Rout, Baijayant Panda, Prafulla Ghadai and others. It requires strong action from the BJD president and Chief Minister to convince people that his government doesn't encourage corruption but deal with it with an iron hand. This would substantiate the audacious claims by the CM over last two decades about the character of his government in the State. Inaction in regard to these charges rather indirectly confirms that corruption prevails under patronisation of key persons in the government and influential leaders from the ruling party. And, in democratic politics, people mustn't be taken for granted all the time. Once they start disbelieving a party or a leader, it's really really hard to get them back on track. Look at the congress party in Odisha and see how it's struggling since 2000 to regain its political importance! Leaders of Biju Janata Dal and its so called strategists mustn't forget or ignore this fact. Nice analysis! And, BJD must be extra-cautious about 2019 elections.